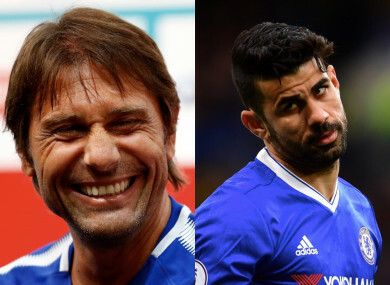 CHELSEA MANAGER ANTONIO CONTE was inevitably asked about striker Diego Costa at his Friday press conference but his reaction certainly took many people by surprise. The Brazilian-born Spanish international has been deemed surplus to requirements at Stamford Bridge and, in a wide-ranging interview with the Daily Mail recently, blasted Conte and the reigning Premier League champions for not letting him return to Atletico Madrid. “They want me to be there training with the reserves”, he said. Conte was asked about Costa’s outburst and his response was unexpected. Conte started to laugh while a reporter was still listing off the main talking points of Costa’s interview, the ‘criminal’ comment proving too much for the Italian. After composing himself, he acknowledged the only way to deal with ‘the past’ was through humour. “It’s great. I prefer to laugh,” he said. With Costa instructed to return to London and get back to full fitness, Conte was pressed on whether the attacker would be selected again if he was to come back. Email “Antonio Conte was quizzed about Diego Costa and his response was pretty unexpected”. Feedback on “Antonio Conte was quizzed about Diego Costa and his response was pretty unexpected”.